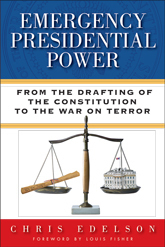 Readings and resources concerning presidential power. Criminal Liability, Special Prosecutor, etc. This article introduces a special issue on Invoking Inherent Presidential Powers, available on JSTOR (UW restricted). Oren Gross, Emergency Powers, in The Oxford Handbook of the U.S. Constitution (2015). Youngstown Sheet & Tube Company v. Sawyer, 343 U.S. 579 (1952), HeinOnline, Google Scholar. Patricia L. Bellia, The Story of the Steel Seizure Case, in Presidential Power Stories 233 (Christopher H. Schroeder & Curtis A. Bradley eds., 2009), print and West Academic Study Aids online.